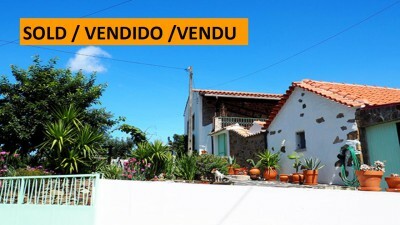 Situated on the edge of a quiet village, 10 minutes drive from Castanheira de Pera and Figueiro dos Vinhos, this pretty house with lots of character offers the rare opportunity to acquire a beautiful home and an established, registered business. The main house is on two floors and there is a separate guest annexe. Entry to the property is via a large metal gate to a slate paved driveway and a spacious garage currently used as a workshop. To the right, a gate leads to a nice flat piece of land with a variety of fruit trees and a vegetable garden. This area could also be suitable for a pool area if desired. To the left is a sunny slate paved patio with a seating area, and a lawn with mature shrubs, many pot plants (included in sale) and more fruit trees. A path leads to a large hen house and a graveled area for drying clothes. There is also secure storage for the gas bottles. Double doors lead to a small courtyard with the main house on the left and the annexe on the right. The door to the house is aluminium with glazed panels and opens onto a hallway with stairs to the upper level. On the left is a large shelved pantry and a fully fitted kitchen with pine wall and base units, granite worktops, double white sink, and a tiled floor. All appliances are included in the sale price. To the right of the hall is a tiled shower room with a gas shower, a bidet, a wc and sink. Next door is a spacious double bedroom with wooden beams, original exposed stone feature wall, tiled floor and built in storage under the stairs. At the top of the stairs is a lounge/dining room with a wooden floor, wood burner and a door to the sunny veranda with views over the mountains. Steps from here lead down to the courtyard. Off the sitting room is the second double bedroom which has two large windows and an exposed stone wall. There are central heating radiators throughout, currently not in use but could be reconnected. Across the courtyard is the guest annexe which has recently had a new roof. Here there are two double bedrooms, a shower room with an electric shower and a covered BBQ/kitchen area with a double stainless steel sink, fridge and space for a table and chairs. In Castanheira de Pera and Figueiro dos Vinhos you will find all essential amenities such as: health centres, pharmacies, supermarkets, schools, banks, restaurants, cafes and Saturday markets. There are lots of river beaches close by for swimming and many have restaurants/bars on site. Castanheira de Pera also has Praia de Rocas, a manmade beach and lake with pedalos, wave machines etc. This is also a wonderful area for hiking, cycling, fishing, horse riding, and water sports.